If you love thrilling surround sound, the Onkyo TX-RZ830 delivers clean, powerful audio performance at any volume. This 120-watt-per-channel 4K-compatible receiver decodes the latest formats for immersive, three-dimensional effects to complement your TV's lifelike Ultra HD picture quality. 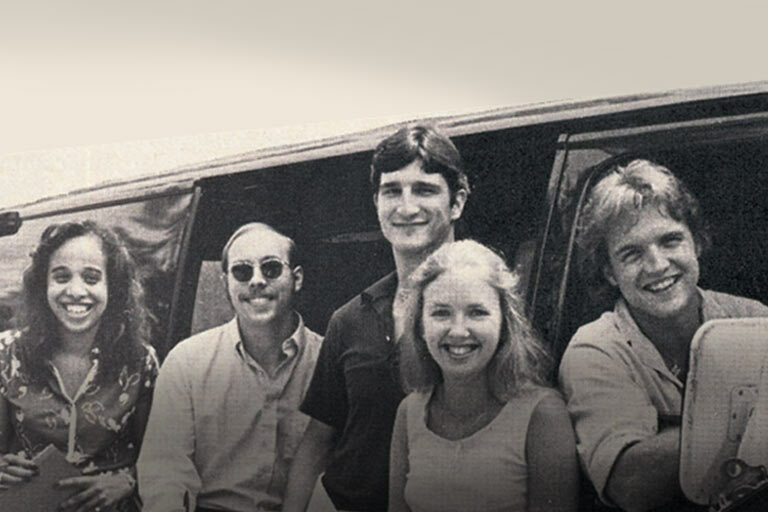 THX® certification means you'll get spot-on, distortion-free reproduction of movie soundtracks. Convenient wireless music options, multi-room music, and easy app control make this receiver a winner for movie nights, parties, and everyday entertainment. Onkyo's premium RZ Series home theater receivers deliver music and movie soundtracks with detail and accuracy. The 'RZ830 is constructed with quality components like large custom capacitors for consistently great sound throughout the frequency range. Its advanced amp circuit layout prevents phase shifting, for a clearly focused audio image and reduced distortion even at high volume levels. The 'RZ830 gives you all kinds of options for wireless listening. Built-in Wi-Fi gives you access to popular streaming services like Spotify® and Pandora®, along with tracks you have stored on your networked computer. Apple® AirPlay® lets you stream from compatible iOS® devices, and Bluetooth adds even more streaming music options. The 'RZ830 also works great as a component in your Sonos wireless multi-room music system. Just add a Sonos Connect and you can send any music or audio source from the Sonos app to the receiver. It'll even automatically turn on and switch to the correct input when you fire it up in the Sonos app. The 'RZ830 has outputs for 11 speakers, allowing for different home theater and wired multi-room music configurations (just remember, its nine amplifier channels can't power more than nine speakers at once). You can use all nine channels in a 5.1.4 or 7.1.2 Dolby Atmos or DTS:X system, or you can go with a more modest surround sound setup and repurpose the extra channels in one of a few ways. You can also connect a stereo receiver or amplifier through line-level Zone 2 and Zone 3 connections and use the 'RZ830 as a preamp, so you can use all nine channels for surround sound in your home theater and still get stereo sound in up to two additional rooms. Whole House Audio mode lets you turn on and synchronize all audio zones with a push of a button. Does this work well with the Logitech Hub ? I'm sorry but I have no idea. I am not using any universal remotes. 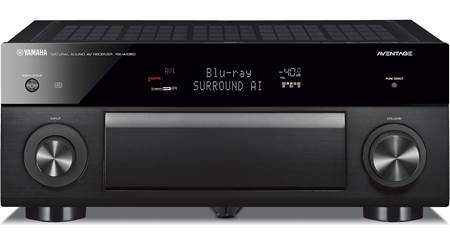 Dynamic Audio Amplification: The TX-RZ830 AV receiver features Onkyo's Dynamic Audio Amplification with a 9-channel amplifier rated at 120 watts (into 8-ohms, at 20Hz-20kHz, with 0.08%, driving 2 channels). 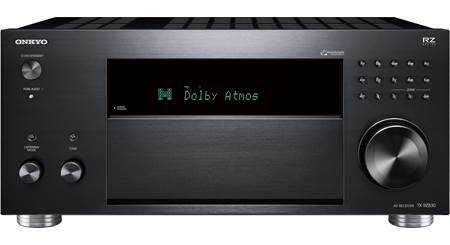 Onkyo's new Dynamic Audio Amplification technology incorporates a Hi-Current, non-phase shift amplifier design with discrete output stage circuitry and a H.C.P.S (High Current Power Supply) capable of driving 4-16Ω speakers with dynamic control, while producing clear, detailed sound. 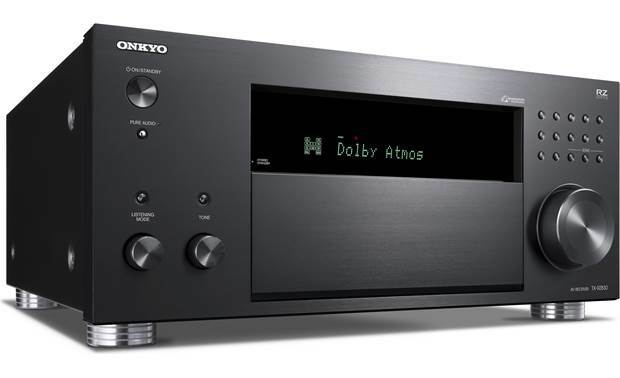 32-Bit Architecture: The Onkyo TX-RZ830 AV receiver utilizes 32-Bit architecture with Dual 32-Bit DSP Engines and a 384kHz/32-Bit Hi-Grade DAC for exceptional sound quality. Dual 32-Bit DSP Engines: The Onkyo TX-RZ830 employs powerful and highly accurate 32-bit DSP (Digital Signal Processor) engines for better surround sound reproduction. Advanced Circuitry: The Onkyo TX-RZ830 incorporates a variety of advanced circuitry to eliminate jitter & distortion for cleaner, clearer sound reproduction. AccuEQ Advance Calibration w/ AccuReflex: The TX-RZ830 incorporates AccuEQ Advance calibration technology and comes with an auto calibration microphone. AccuEQ Advance calibration technology reveals the true potential of your speakers by eliminating standing waves from your listening space using multipoint measurements. These acoustic peaks distort the audio image and prevent your loudspeakers from voicing the sound as their designers intended. AccuEQ Advance also utilizes Partial Band Equalization and only corrects frequency response below a certain point, leaving high-order harmonics untouched - so your speakers are free to reproduce the emotion in the recording faithfully and naturally. In addition, AccuEQ Advance includes three memory presets you can use to save your own customized EQ settings, perhaps tailored to suit different content such as movies, music, or games. Immersive Surround Sound: The Onkyo TX-RZ830 AV receiver goes beyond regular surround with the latest immersive surround sound formats, including Dolby Atmos, & DTS:X. The TX-RZ830 also supports Dolby Surround & DTS Neural:X that enhances two-channel and multichannel content and decoding formats with immersive surround sound. 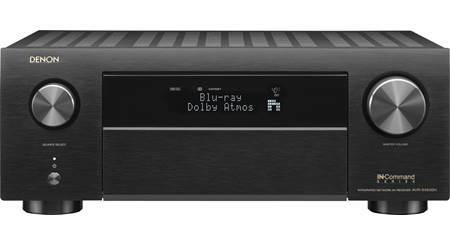 Dolby Atmos: The Onkyo AV receiver will enhance properly designed systems with Dolby Atmos where sound comes alive from all directions, including overhead, to fill the home theater with astonishing clarity, power, detail and depth. The TX-RZ830 has the processing power to run a more enveloping 7ch, 9ch, or 11ch Dolby Atmos layout using a 5.1.2, 5.1.4, 7.1.2, or 7.1.4* configuration with ceiling mounted, or Dolby Atmos-enabled speakers (sold separately). *A 7.1.4 configuration requires an additional power amplifier to power the Surround Back speakers. Audiophile Listening Modes: The Onkyo TX-RZ8300 offers two audiophile listening modes which bypass the receiver's tone & DSP processing for higher sound quality performance. In Direct mode, audio from the input source is output without surround-sound processing. This mode delivers pure sound with minimum sound quality adjustment and filtration. In Pure Audio mode, the display and video circuitry are turned off, minimizing possible noise sources for the ultimate in high-fidelity audio reproduction. 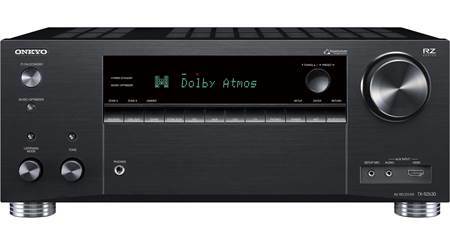 Audio Enhancements: The Onkyo TX-RZ830 receiver provides various audio enhancements to deliver a high-quality listening experience every time. Analog Audio Outputs: The Onkyo TX-RZ830 is outfitted with the following analog audio outputs. 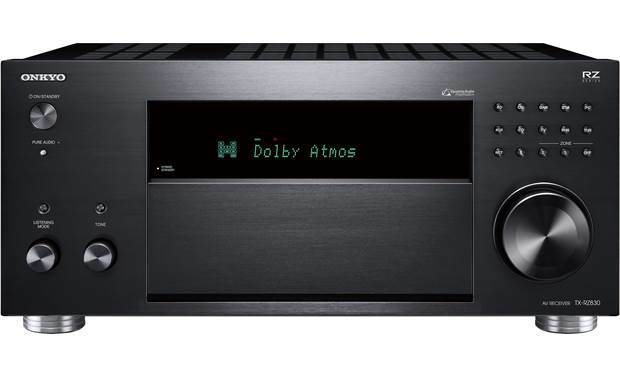 11.2ch Pre-Outs: The Onkyo TX-RZ830 features 11.2ch pre-outs (Front, Center, Surround, Surround Back, Height 1, Height 2, and Dual Subwoofer) for connection of an external power amplifier or amplifiers. The pre-outs are variable. The dual sub outputs are wired in parallel and share the same input signal (they are not discrete). Phono Input: The TX-RZ830 has a discrete low-noise phono pre-amp and is outfitted with Phono (MM) input for connection of a turntable with a moving magnet cartridge so you can enjoy listening to your vinyl records. There is also a ground screw terminal. Front-Panel Aux Input: The TX-RZ830 is fitted with a front-panel 3.5mm Aux input for connecting a portable audio player. 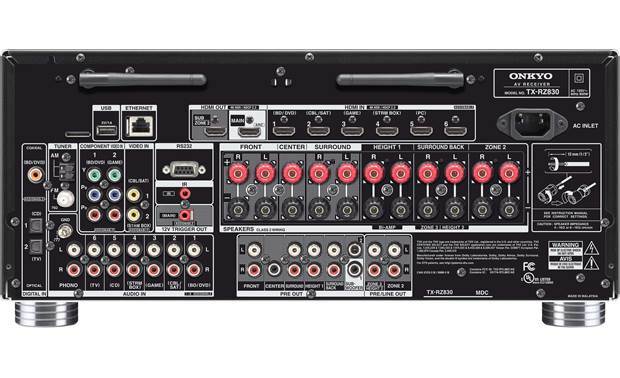 HDMI 2.0b: The Onkyo TX-RZ830 has seven HDMI 2.0b inputs (6 rear/1 front) and dual HDMI 2.0b outputs. Thanks to the latest HDMI 2.0b specification, the receiver can support 4K/60 Hz Ultra-HD video, HDCP 2.2 compatibility, 4:4:4 color sub-sampling, High Dynamic Range (HDR), and BT.2020 Wide Color Gamut. 4K/60Hz: The TX-RZ830 supports up to 4K (3840x2160 pixels) video @ 60 frames per second on all of its HDMI inputs and outputs. It will also pass a 480p, 720p, 1080i, or 1080p video signals via HDMI (not compatible with 480i video signals). Other HDMI Features: The TX-RZ830 AV receiver's HDMI connectivity also offers 3D video pass-through, Deep Color & x.v. Color support, as well as an auto LipSync function. Wired or Wireless Network Connection: The Onkyo TX-RZ830 AV receiver supports a wired Ethernet (RJ-45) or wireless WiFi (802.11 a/b/g/n; 2.4/5GHz) network connection. Via the AV receiver's network connection, you can enjoy music files stored on your computer and listen to internet radio through a variety of online music services. Built-in Online Music Services: The Onkyo TX-RZ830 offers several built-in internet radio & online music services through its wired or wireless network connection. Built-in Bluetooth: The Onkyo TX-RZ830 features built-in Bluetooth (version 4.1+LE) with support for profiles A2DP 1.2 and AVRCP 1.3. You'll be able to wirelessly stream stored music and music apps from your Bluetooth-enabled Apple iPod/iPhone/iPad, Android smartphone/tablet, Windows Phone/PC, & Mac laptop/computer, as well as other Bluetooth compatible devices to the Onkyo receiver. The receiver has a 48' wireless Bluetooth range. You can even set the receiver to automatically turn on when a Bluetooth source device is paired and connected. SBC + AAC Codecs: In addition to support for the standard SBC Bluetooth audio codec, the TX-RZ830 offers support of AAC. By supporting AAC, the receiver offers better audio performance of the music streamed from your Apple iPod, iPhone, or iPad. Zone 2 HDMI Output: The Onkyo TX-RZ830 provides a Zone 2 HDMI output, so two different HDMI audio/video feeds can be sent to two different displays at the same time directly from the receiver (HDMI 1-2-3 connected input sources only). HDMI Zone 2 will output up to 4K video and 2-channel audio for the HDMI input source selected. Video will be output at the highest resolution supported by both TVs. If you have the same HDMI source playing back in the main room and Zone 2, then the main room is also limited to 2ch PCM audio. Line-Level Outputs: By using the line-level outputs on the TX-RZ830 you can connect an external receiver or integrated amplifier in a second room, allowing you to listen to 9.1ch or 7.1.2ch surround in the main room and play a different audio source in another room of your home. The volume of Zone 2 can be controlled from the TX-RZ830 or your add-on integrated amplifier/receiver. Speaker Level Outputs: By using the speaker-level outputs on the TX-RZ830, you can directly connect a secondary pair of speakers in another room of your home, allowing you to listen to 7.1ch or 5.1.2ch surround sound in your main room and play a different audio source in the other room. The volume of Zone 2 is controlled from the receiver. Compatible Sources: AM/FM tuner, Analog audio inputs, HDMI 1-2-3 audio inputs (2ch PCM only), Optical/Coax digital audio inputs (2ch PCM only) , USB & Bluetooth Audio, Network (including DLNA, AirPlay, & built-in music apps) can be played back in Zone 2. Incompatible Sources: HDMI video and analog video sources cannot be output to Zone 2. HDMI (4-5-6-7) inputs and DSD audio files cannot be played back in Zone 2. Chromecast built-in not supported in Zone a.
Line-Level Outputs: By using the line-level outputs on the TX-RZ830 you can connect an external receiver or integrated amplifier in a second room, allowing you to listen to 9.1ch or 7.1.2ch surround in the main room and play a different audio source in another room of your home. The volume of Zone 3 can be controlled from the TX-RZ830 or your add-on integrated amplifier/receiver. Speaker Level Outputs: By using the speaker-level outputs on the TX-RZ830, you can directly connect a secondary pair of speakers in another room of your home, allowing you to listen to surround sound in your main room and play a different audio source in the other room. If you are only powering Zone 3 from the receiver (and Zone 2 is using line-level and an external amplifier), the receiver is limited to 7.1ch or 5.1.2ch in the main room. If you are powering both Zone 2 and Zone 3 from the Onkyo TX-RZ830, the receiver will be limited to 5.1ch surround in the main room. The volume of Zone 3 is controlled from the receiver. Compatible Sources: AM/FM tuner, Analog audio inputs, USB & Bluetooth Audio, Network (including DLNA, AirPlay, & built-in music apps) can be played back in Zone 3. Incompatible Sources: HDMI audio/video and analog video sources cannot be output to Zone 3. Optical/Coax digital audio inputs and DSD audio files cannot be played back in Zone 3. Chromecast built-in not supported in Zone 3. HDMI Control: This function allows HDMI-CEC compatible components or RIHD-compatible components connected via HDMI to be controlled with the TX-RZ830. The AV receiver offers the following HDMI-CEC controls. Custom Control Integration: The TX-RZ830 offers custom control integration. The TX-RZ830 features a 12V/100mA trigger output (3.5mm) to power on an external component with a 12-volt trigger input, and an IR input (3.5mm) for remote control range extension. It also supports IP (web) control and RS-232, enabling configuration via PC and integration into a home automation system. I am building a garage and want to make it my "zone 2". Everything says that if I go with zone 2, it turns my main to a 5.2. I have a two channel amp. Is there a way to run the amp so that I can keep my 7.2 in my main and power zone 2? Hello Aaron, I apoligize I wouldn't be able to answer your question. I didn't purchase the Logitech Hub. I'm sure one of the excellent Crutchfield experts can help. if I hook up a separate amp to the right left center preamps would the unit still power those thru this unit also? So on first set I set it 6ohms but I need it to be at 8ohms. Now the receiver only gives me the option of 4ohms or 6ohms! How do I get it to give my 8ohms option again? Mine will not give the option of 8 ohm either. Page 133 of the English manual addresses this. There are only 2 settings. 6ihms for 6 and above and 4 ohms if any speakers hav an impedance of 4-6 ohms. Hopefully all your speakers are the same. Not sure what to do if you had some 6 or above and some below. Does this receiver allow firmware updates? If so, any idea if future updates will enable Amazon music and Alexa voice control? These are two things I need in my new receiver. It's a new reciever, so any plans about an upgrade are up in the air, but it does support voice controls through Google home and Google assistant. Have they fixed the hdmi issues with this model? I guess I got lucky with my previous Onkyo the TX-NR818 , which I still have (exercise room duty). Needed to upgrade to 4K. So far, no handshake issues with Xbox One X, Roku 4K, Vizio 2018 P75 streaming apps (Netflix, etc) and Spectrum cable. Only have had for a week but so far so good. Well I Recently purchased this Receiver and It's been working GREAT for me,And it's strange How onkyo is kind of known for their Alleged HDMI board problems but this is my FOURTH onkyo Receiver and i have Had nary an issue with ANY of them. I purchased this unit about 3 weeks ago and have no hdmi issues and have utilized every port. I am going to say yes, because my Receiver is working great !! Can you hook up a separate equalizer to this amp? Searches related to the Onkyo TX-RZ830 9.2-channel home theater receiver with Wi-Fi®, Bluetooth®, and Chromecast built-in.